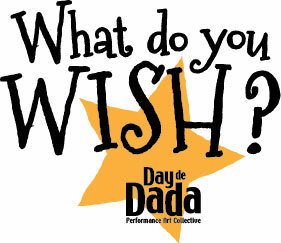 Day de Dada has been collecting wishes for the last year and drawing them on maps, collecting them in the air, whispering them, fanning them, and planting them so they can grow. Some wishes have been rolled into beads, some have been tossed like a coin in a fountain, and some have been released by fire. There is great power in a disclosed wish, it begins an energy movement. Have you thought about your wishes? Are you willing to share them? You can express your wishes by mail or in person July 16 – Sept. 20, 2015 at SI Arts Culture Lounge in the Staten Island Ferry Terminal. On view will be a wish filled collection of international mail art and video, and a sound installation. Culture Lounge visitors have the opportunity to make their own wishes, write a wish on a cloth strip and tie it on the fence installation, create mail art wishes to send off to someone or make a wish on the spot by selecting a traditional or non-traditional wishing action. The Wish Sisters will be in person collecting wishes at various times throughout the exhibit. wish upon a star, on a penny, on a wishbone, on a rainbow, a straw wrapper, a found eyelash, birthday candles, a white horse, a wishing well, ladybugs, dandelions, falling leaves…..